Click on a photo to see more. There was lots of fun for all the family at this year's Fun Day, including face-painting, circus skills and a BBQ. A good time was had by all. 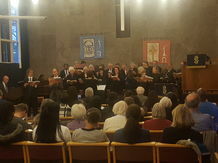 For the 15th year running our service on Good Friday was a choral service, sung by a choir made up of HHUC singers with friends from other local choirs and churches. This year we sang extracts from Handel's Messiah, with soloists Lizzy Thompson, Mike Thompson and Greg Swinford. On Easter Sunday we began with a short service celebrating the resurrection, followed by breakfast together in the hall. Our main service in the church included Holy Communion. The children made an Easter garden, which they brought into church to show us. 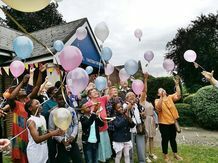 The Youth Choir celebrated its 15th anniversary by singing "Jonah-man Jazz" during the morning service to a large congregation. Several former members of the choir came back specially to join us for the occasion. 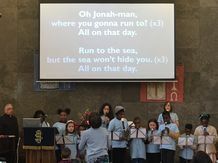 The Recorder Group played the spiritual "O sinner man", and invited the congregation to sing along with words to suit the story: "O Jonah-man, where you gonna run to?" 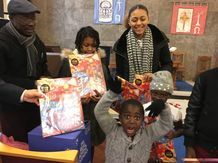 On the first Sunday in Advent we had our gift service, when we brought toys and other gifts for the Salvation Army's Christmas Appeal. On the third Sunday in Advent we presented a Nativity Play - The Well Good News of Christmas - then on the fourth Sunday the young people made Christingles during the morning service. That evening we had our annual Carols by Candlelight Service, then all-age worship on Christmas Day itself.